I recently received a letter from a 30-year-old woman who perceives our universe as a living organism. She wrote: "If you magnify an eyelash, or a drop of water, you will see millions of living cells and organisms floating around. I believe we, as humans, are part of a chain (of life) and we are a part of a higher being. . . we could be organisms (living) on another being for all I know. I believe life lives upon life, like fleas on a dog. We are humans on the Earth. Think of the Earth as one cell working in conjunction with millions upon millions of other cells." Her letter reminded me of a revelation I experienced as a young man. It came to me while I was standing one bright spring day deep in a small forest on my father's Michigan farm. As I stood there, smelling the rich aroma of the trees and grass and flowers springing to life after a winter's slumber, I could almost hear the sap rushing through the bark of the trees and sense the thunder of a reawakening Earth under my feet. It was at that moment that I understood that the planet was a living organism. I also thought about the perfect orderliness of the universe; how the planets are in constant motion around the sun, the sun is in constant motion in our constellation of suns, and even the constellation is in motion among the other constellations. Looking within, I thought about our understanding of the tiny atoms, and how the particles of every atom are in constant motion. If all things are in constant movement, and all movement is following a perfect pattern without chaos, then the entire universe must be alive, I marveled. All of this came to me in a flash. I was given a brief glimpse of a wonderful truth. Even though I was perhaps viewing it from the perspective of an ant looking out over the back yard from the top of a tall weed, I was privileged. I was allowed to temporarily remove the social blinders skillfully installed over my eyes. For that instant, I had an understanding shared by the ancients, who knew that both the Earth and the Sun were living beings. We are all part of The One. We are the I AM. When my wife, Doris and I lived briefly with the Navajo and Hopi people in Arizona a few years ago, we were acutely aware that the aboriginal people respect and even worship the Mother Earth as a living deity. When we offered a Hopi two-horned priest a meal in our home, we were surprised that before he ate a single bite of his food, he took a portion of it into the yard and offered it back to the Earth from which it came. This man spent the night with us. He was awake before dawn. We found him sitting on a rock and welcoming the sunrise. 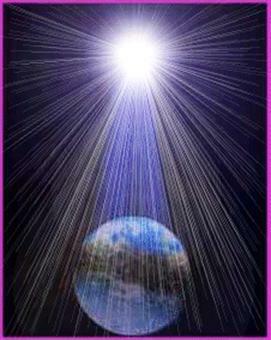 It appears that the Hopi also believe the Sun and the Earth are sentient beings. During our time in Arizona, Doris and I were working hard to shake off the old tunnel realities implanted by years of social conditioning. While we could talk about how we respected and cherished our environment, it was difficult for me to really believe that a rock, the distant mountain and soil I walked on were part of a living organism. Unlike the eagle soaring overhead, or the coyote slinking across the desert, the planet does not appear to breathe, it has no blood flowing in its veins, or a pumping heart. Consequently, I reasoned that it probably was not a conscious living being. I had temporarily forgotten the vision of my youth. The reality of it has been brought back to me, not only by a letter from a reader, but through our contact with entities in the spirit world around us. When we inquired about the probability that both the Sun and Earth are alive the answer was shockingly affirmative. Not only are the sun and the planets in this solar system alive, they are deeply aware of the human destruction going on and they are communicating with each other about it. Associated with this has been a warning issued by remote viewer Ed Dames. Dames has been warning for years that he and his team have been seeing a major solar "event" that he believes will strike the Earth. Apparently they are seeing a flash of light and are interpreting it to be a deadly solar flare. Dames said he has an image of this event occurring in the midst of a great war. He said the event is so spectacular that soldiers stop in mid-battle and look up. It is interesting to compare what Dames appears to be seeing with a prediction being made by the Abba Father as well as many of the enlightened ones now on the planet. They foresee not a solar blast, but a dynamic shift that moves the Earth and those who are prepared for it into a new dimension. The invitation is for all humans to get ready for this change by raising their frequency, firing up the light within each cell, and just lighting up. When we do this, we qualify to bring the soul, which is a bright light hovering just above our heads, into the body and exchanging it for the spirit. When we reach this spiritual state, we will be as gods. Few are listening and fewer still are doing the work. Thus it is possible that when this event occurs, those who are left behind will observe something quite shocking in the sky. In a strange, twisted way, the Book of the Revelation talks about some kind of spiritual event occurring in the midst of the final world conflict known as the Battle of Armageddon. Instead of Jesus and his white robed saints descending from the sky, however, the interruption may well appear as a bright light in the sky. According to Revelations 6:15 something causes "the kings of the earth, and the great men, and the rich men and the chief captains, and the mighty men, and every slave and every free man" to hide "in the dens and in the rocks of the mountains." Could they be hiding from the events linked to a major pole shift and dimensional change? Revelation 14:18-20 talks about an angel of fire who summoned a second angel with a sharp sickle (used for harvesting) saying: "gather the clusters of the vine of the Earth; for her grapes are fully ripe (human overpopulation). "And the angel thrust in his sickle into the Earth, and gathered the vine of the Earth, and cast it into the great winepress of the wrath of God. And the winepress was trodden (outside) the city, and blood came out of the winepress, even unto the horse bridles, by the space of a thousand and six hundred furlongs." A furlong is an ancient measurement of about one eighth of a mile. Thus the blood will cover the ground for an area of about 200 square miles. Also notice in Revelation 19:17 there is a description of "an angel standing in the sun" who calls upon all of birds to feed upon the carnage of the dead humans. There is no doubt in my mind that the humans occupying this planet deserve the wrath they are about to bring upon themselves. We have grossly overpopulated and ravaged our planet to a point where there is little chance of saving its ability to sustain life. The problem has gotten so severe some believe the planet's life is now severely threatened. The human history on the Earth has been like a cancer, growing and consuming the planet's "resources." We have destroyed the forests. We polluted the air. We poked holes in the ozone layer that shields us from the harmful rays of the Sun. We have destroyed thousands of living species. We have polluted the lakes and oceans to a point where they also are dying. In spite of repeated warnings, there seems to be no indication that this madness is going to be voluntarily halted. I suspect that the angelic forces are gathering to wage war . . . not against the enemies of any religious sect . . . but against the entire human race. We are overlooking the possibility that our living planet is not about to perish, but is about to take radical steps to remedy the problems we have created. It might be comparable to a dog rolling in the dirt and shaking the fleas from its back.